The nineties in some ways seem like the sixties revisited: a mendacious president lies to us about the justification for and the status of an unwinnable war as the body count mounts; meanwhile, secret government programs violate civil liberties as the country slides ever closer to a state of dictatorship. The parallel seems to break down when it comes to the reaction to governmental lies and misdeeds: no-one is in the streets opposing all of this. 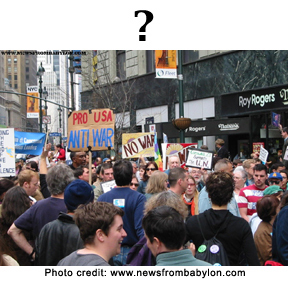 Given how low the president's approval ratings are, and how much of the population is opposed to the war, where are the demonstrators? We just had another anniversary of the war, and only a few hundred people came out on the streets, as opposed to the hundreds of thousands we had a couple of years ago. Given that things have gotten worse, why haven't those large demonstrations become larger? Here are some possible reasons for the drop-off in dissent. The demonstrations represented a public sentiment that was broad but not deep. Every once in a while, an organizer catches a moment like a surfer catching a wave, appealing to the imagination and bringing people out of their houses who have no deep commitment to dissent or politics but who are enjoying participating in the one event. For precedent, I cite an anti-nuclear demo in the eighties that brought out up to a million people in some cities around the world...that similarly had no sequel whatever. The government's covert and illegal activities have resulted in a chilling effect. In New York City, the police have successfully put aside the Handschu injunction which limited their covert operations and dirty tricks against peaceful dissenters. In memoranda produced in discovery in renewed civil liberties legislation, police officials brag about the effectiveness of preemptive arrests of demonstrators. I recognized even in the much more active '60's that most people, regardless of their commitment to a cause, were not willing to risk an arrest record or being beaten. The cops' aggressive handling of protestors at the Republican convention and of phenomena like the mass bicycle rides of late clearly send the signal that very little dissent will be tolerated in this city. At the national level, there have been revelations that the FBI is right back to infiltrating the most harmless groups. As I have pointed out before, it is so much easier to spy on amateurs than professionals that it seems only human nature for the leaderless FBI to concentrate on soft targets. (What's the difference between a boy scout troop and the FBI? A boy scout troop has adult supervision.) Also, the reecntly revealed pandemic of warrantless wiretapping suggests (again, a flashback to the sixties) that the feds are listening to whomever they want, with no standards and no discrimination. The end result is that there is a new, Soviet-style paranoia in this country, where subtly, almost on an inconscious level, the costs of publicly opposing the government may have been raised to unacceptable levels. The organizers are doing a damn poor job. At the time of the big demonstrations, I signed up on a number of email lists so I could find out when demonstrations were to be held in New York City. Three years later, I am no longer receiving email from any of those groups. They simply haven't done their grass roots organizing job of reaching out to people like me, and staying in touch. One of the significant features of the demonstrations I attended was also that they were all over the map--rather than concentrating on the closely related gross issues of the war and the attendant assault on our rights, speakers at the rallies were allowed to wander into completely unrelated areas like Chicano and immigrant rights, violence against gay people, etc. These were all notable and appropriate issues for a leftwing coalition--but we weren't building one, as events have proved. Before I salute a flag, I need to know what it stands for. If I come out to a demonstration only to find that everyone else there is a member of the Socialist Workers' Party, I will feel uncomfortable and in fact deceived. The leadership of a movement, like the president of a country or a company, should clearly communicate the strategic mission and the tactical goals of particular events. The antiwar movement hasn't done this. No-one's ox is gored. For the past three years, I have been putting much of my spare time into writing, directing and producing plays. Not a single one of these plays has yet been a protest against the war or the assault on liberty. I could have spent that time as a lawyer litigating cases about illegal detentions or the treatment of demonstrators, or trying to organize my own demonstrations. I didn't choose to. (I haven't solved the problem of how to write a play on these topics without seeming preachy and programmatic-- art and dissent seem to me two completely different things. But that is a separate topic and anyway, I offer this thought as an observation, not a justification.) One very important difference between the '60's and today is that we had the draft. People come out into the streets more easily when their personal stakes are real and not simply abstract. As a 51 year old, I am not threatened by a renewed draft, nor is there any perceived threat right now to the children in my family. Other people's children are dying, who volunteered to go to war, so perhaps there is a complacency about this that cripples any real national dissent movement from forming. We are more complacent than we were thirty years ago. It is possible that after thirty years of television entertainment, politicians telling us we are the best in the world and entitled to everything for nothing, fast food meals, lotteries, lack of exercise, rags to riches movies, and "first person shooter" games, we have become as soft, brainless and short of attention as the administration would have us be. Or perhaps it is the equivalent of 1966 and it will take two more years for a really active protest movement to form. Perhaps we always wake slowly. I am waiting to see if we can still wake.